The following is a New York Times article that details the world around the President from his election to the present day. Barack Hussein Obama was sworn in as the 44th president of the United States on Jan. 20, 2009. The son of a black man from Kenya and a white woman from Kansas, he is the first African-American to ascend to the highest office in the land. He is also the first new president since terrorists attacked New York and Washington on Sept. 11, 2001, the first to use the Internet to decisive political advantage, the first to insist on handling a personal smartphone while in the White House. So striking was the unlikeliness of his candidacy that he embraced that aspect, calling himself "a skinny kid with a funny name" and making "change" the theme for his campaign. It was a theme with deep resonance for a country enmeshed in what was widely believed to be the worst downturn since the Great Depression. Abroad, many challenges loomed: the war in Iraq, the worsening conflict in Afghanistan, the repercussions from Israel's broad assault on Gaza, the threat of terrorism and the increasing signs that the economic woes that began on Wall Street had spread across the global economy. Mr. Obama arrived at the White House with a resume that appeared short by presidential standards: eight years in the Illinois State Senate, four years as a senator in Washington. He had managed to wrest the Democratic nomination from a field of far more experienced competitors, most notably Senator Hillary Rodham Clinton, whom he outlasted in what became an epic primary battle. And he defeated Senator John McCain, the Republican of Arizona, by an electoral margin of 365 to 173, while outpolling him by more than eight million votes. During the campaign, Mr. Obama laid out a set of large promises that were solidly within the traditional agenda of the Democratic Party, with plans to offer health insurance to all and reduce carbon emissions at the top of the list. At the same time, he proposed moving toward what was sometimes called a post-partisan landscape, appealing to voters of all stripes to come together. As he took office, voters seemed cautiously optimistic, with high hopes for the Obama presidency mixed with a sense that complicated problems would take years to resolve. Mr. Obama's first year in office was remarkably crowded, with major decisions on conflicts winding down in Iraq, and stepping up in Afghanistan. At home, the Obama administration's early months in office were dominated by a single issue: the economy. In fact, the economy's seemingly relentless slide in late 2008 began reshaping the Obama team's plans long before Inauguration Day, as first the candidate and then the president-elect was pulled in to discussions over whether to bail out the financial system, and then into the raging debate over whether and how to keep General Motors and Chrysler from going under. Mr. Obama's first major initiative was a gigantic stimulus package to pump money into an economy in something close to free fall. He introduced the outlines of a plan before taking office, and spent much of his first weeks engaged in negotiations with Congress that led to the passage of a $787 billion bill. Republicans derided the bill as unaffordable and wasteful. Not a single Republican in the House voted for the package, and only three Republican Senators did -- just enough for Mr. Obama to avert a filibuster. 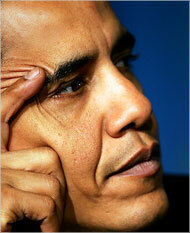 The vote seemed to presage the reception of the health care reform efforts Mr. Obama put at the top of his agenda. As bills made their way through Congress over the summer and fall, only one Republican senator, Olympia J. Snowe of Maine, seemed at all inclined to cast a vote for the Democratic plans. Conservative anger boiled over during Congress's August recess, and it took a televised address to a joint session of the House and Senate by Mr. Obama in September to stop the slide of his own popularity and that of the health plans. Overseas, Mr. Obama quickly reshaped policy on the wars in Iraq and Afghanistan. In Iraq, he set a date of August 2010 for a pullout of most troops. He ordered that 21,000 additional troops be sent to Afghanistan, significantly stepping up American military involvement. Pakistan became a new focus of administration attention, as the Taliban continued to seize ever-larger swaths of the country's western regions. On his second day in office, Mr. Obama issued executive orders banning torture and closing the secret prisons run by the Central Intelligence Agency. In April, he released memos from the Bush administration Justice Department that authorized brutal treatment of so-called "high value'' terrorism suspects, a move that ultimately led to a criminal investigation of the handling of detainees. In general on foreign policy, Mr. Obama sought to emphasize diplomacy and multilateral cooperation, in place of the go-it-alone attitude that marked much of George W. Bush's presidency. In some areas there were few early signs of success -- North Korea defied the U.S. and the United Nations by holding more missile tests. But Iran produced some potentially significant concessions on its nuclear program in the first face to face meetings with the U.S. under the Obama administriaton. In a stunning surprise on Oct. 9, 2009, the Nobel Committee announced that it had awarded its annual peace prize to President Obama "for his extraordinary efforts to strengthen international diplomacy and cooperation between peoples."